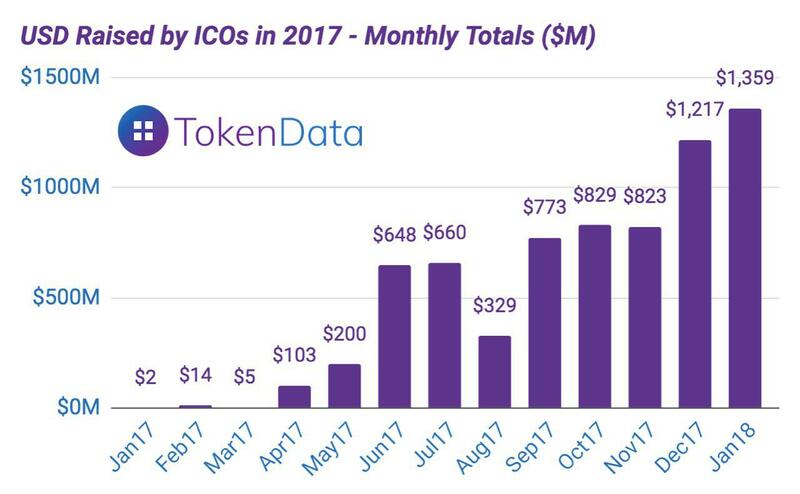 It sure feels a little counterintuitive to call RIP ICO just as Telegram is gearing up for a monster $1B+ public sale (4x oversubscribed apparently) and as January set another record month: $1.4 billion from 67 reported ICOs. However we are coming across more and more projects avoiding public sales all together, opting instead for phased out private-only rounds structured as traditional equity rounds or SAFTs/private pre-sales, or a combination of both in sequence. Data provided by our friends from Tokendata show that, in January, $180 million worth of capital was raised by projects that had initially planned a public sale, but eventually cancelled it and raised privately. These include Olympus Labs, Nucleus Vision, Coinfi, Shipchain and a bunch of others (not going to lie, we had not heard of most of them). Of the balance, anecdotally 50-75% was possibly raised via private pre-sales. - Most projects don't actually need wide distribution to end users due to the token use case (e.g. addressing enterprises) or model (e.g. some work tokens), and would rather lock-in medium-long term focused institutional investors or strategic partners rather than short-term flippers. - Signalling. The best teams signal to the market that they are in it for the long term by subjecting themselves to professional investor diligence and oversight from early on. As we pointed out in the past, with exceptions, a public ICO is likely to suffer from adverse selection. - A different cohort of founders may be entering the market, one that values and actively seeks the help from traditional investors in company building, governance etc. - More sanity. Founders finally realize the critical importance of network design and token economics for the long term success of the project, thus buying more flexibility and runway to perfect those before launching. There is limited room for manoeuvre once a token is issued. - Increased popularity of alternative token-distribution models aimed at driving actual usage and curb speculation (faircoins, more work-to-earn models like Earn, SteemIt, Gems, forks & airdrops etc). There is presumably less regulatory risk in letting users earn or win a token than in selling it to them. - Increasing importance of and demand for disclosures from insiders (eg vesting, lock-ins, sales etc). What Aragon, District0x etc are doing in terms of transparency will become table stakes, hopefully quickly. - Boom in fully compliant security tokens, fuelled by the emergence of platforms like TrustToken, Securitize, Polymath, Templum etc. Our friends at Fabric Ventures and Tokendata have put together a must read report with a review of 2017 and an outlook for the year ahead. Scenes from a future movie, no doubts. A dozen crypto billionaires, spearheaded by Brock Pierce, have landed in Puerto Rico and are dreaming up about building a crypto utopia. Despite some vague hints at actually doing something there (“to build a crypto utopia, a new city where the money is virtual and the contracts are all public, to show the rest of the world what a crypto future could look like”), this is to their own admittance a move to avoid paying US taxes on their crypto gains while enjoying the rest of their lives. PR conveniently offers expats no federal personal income taxes, no capital gains tax and favorable business taxes, while retaining American citizenship. And no doubts all sorts of drugs. “Earlier that day while scoping out property, they had stopped at a historic Ceiba tree, known as the Tree of Life. There can only be hope that these utopian experiments at least contribute to a local economy recently devastated by a hurricane, while continuing to push the boundaries of blockchain innovation. PS if you are a tax lawyer and are not going after the crypto riches, what are you doing? If you haven't had the time to follow and study the development of the Lightning Network, you should take some time, bookmark this, find a quiet room, put some brain.fm, and then read it all. It's a long read, but it gives you all the pieces you need to know about Lightning. Paired with videos of wallets and other services popping up, I think it makes it pretty clear that the real-world payment problem of crypto will find its solution here. Less oxygen for scammy ICOs that have been polluting an overly-polluted Facebook feed (and more of the web via audience retargeting) for the past 12 months. The heuristic is that good projects don't need Facebook ads in the first place. Another development in the Tezos drama. The community has forked - not the code - the foundation! An example of stakeholder activism that we touched on in issue #20. There is now a parallel structure composed of an association and a Swiss foundation that is tasked to launch the Tezos network shall the Tezos Foundation not collaborate. Notable board members of the new foundation include Olaf from Polychain, a large investor in Tezos. The most interesting bit is that the new foundation claims it can launch the network on its own, which raises the obvious question of why they bothered raising $232m (now worth $1+ billion) in the first place. A bit more color into BitTorrent founder Bram Cohen's personality and Chia Network, the energy efficient bitcoin alternative that he's planning to launch by year end (with a possible ICO at some point in Q2). We've also just read a mildly convincing story which claims Bram could in fact be Satoshi himself! Pending approval by Japan's Financial Services Agency, Line's 200+ million active users will soon be able to buy/sell/send digital currencies. This to us sounds like a much bigger deal than both Telegram and Robinhood, especially given the interest that cryptocurrencies have reached in the East. The main point that comes to mind here is that everyone is envious of crypto exchanges, which are probably the fastest-growing and most-rapidly profitable businesses we've ever seen, while being almost entirely agnostic to the global market price. And they want in. Having 200M users is not a bad entry point. Along those lines, Square's Cash app is rolling out Bitcoin instant buy and sell to most users, after testing the feature in Q4 last year. Offering a crypto product is quickly becoming table stakes for neo banks and money apps, giving Coinbase a good run for their money in attracting new crypto users. Samsung has officially entered the crypto-mining sector, confirming it started mass producing ASIC mining chips in partnership with a yet unidentified Chinese mining company. Given the size of Samsung existing operations, this could pose a serious and most welcome threat to Bitmain's dominance in the mining sector (and to its main supplier TSMC), and will most likely attract new entrants from the old world in the space. As an aside, if you've been here long enough, CAN YOU BELIEVE THIS? Samsung is building Bitcoin mining rigs. Sometimes, I stop and wonder if it's real life. Two investors from Charles River Ventures have open sourced a quantitative framework to score crypto projects across key axis: product, community, code, traction, trading and network. The Google sheet is available here, listing scores for 50+ crypto assets. Helpful to keep track of the health of a live networks, less so to spot things early though. A comprehensive landscape of the DEX ecosystem as of January 2018, by Nathan of VariabL (part of Consensys). If you have 1hr (lucky you), DCG have also recorded a session on the future of DEXs featuring Radar Relay. The Lee's are cashing out. Litecoin Charlie's brother Bobby Lee's startup BTCC, operator of a mining pool, a USD/BTC exchange and a crypto wallet, was acquired by an unnamed HK-based fund for an undisclosed amount. Investors included Lightspeed Ventures, Blockchain Capital and Trilogy Ventures. BTCC was the first Bitcoin exchange in China so this feels little like the end of an era for Chinese crypto exchanges. PS: rumours of Circle acquisition of Poloniex were quickly debunked as fake news. As you know, we're nerds, we invest, and we like crypto. This is the perfect thing to read for cryptonerd investors. Dmitry from Cryptolab tries to find a better NVT. The problem is that peak NVT coincides with the middle of a correction period. NVT is neither predictive (doesn’t precede the overvaluation), nor descriptive (doesn’t coincide with it). You can only detect the bubble a few months after it bursts. In short moving to a 90-day average NVT gives a much better indicator of bubblish activity. Zap is a Lightning Bitcoin Wallet, and it's now in open beta on the Bitcoin testnet! The Lightning network will change everything. It's still the early days. Crypto job boards are all the rage these days. This one solves the chicken & egg issue by pre-vetting development shops that hire full time blockchain engineers, then connecting them to post-ICO projects in need of such talent. Oh, they take crypto as a payment option. Gab, the hotly debated censorship-proof P2P social protocol that seem to have attracted the interest of the altright crowd, have launched their regulated ICO on the Start Engine platform. They will be one of the very first projects to sell tokenized equity via a Reg A+ ICO. The UK’s Royal Mint, a 1,000+ year-old government-owned company responsible for producing the physical money in circulation in the UK, has launched a gold-backed cryptocurrency, the Royal Mint Gold (RMG). What a time to be alive. The concept looks very similar to Digix, except it's not built on the Ethereum blockchain, but on a purpose built one (developed by BitGo). News came out this week that Bitfinex and Tether have received subpoenas on December 6th last year from the CFTC. A subpoena per se does not prove anything really and is apparently a routine occurrence in the financial sector, but it certainly helps fuel speculation about what's really happening behind the scenes at Tether. We really don't know who and what to believe anymore, which makes it really hard to 'price' this risk. On the one hand, the fact that they have continued to print USDT aggressively after receiving subpoenas suggests they are confident they have nothing to worry about. On the other end, the recent news of their auditor dissolving relationship and removing any mention of Bitfinex from their website cannot be a good sign. Bittrex, one of the exchanges with USDT pairs, have also announced this week that they will start taking USD deposits, a sign that they may be rushing out of USDT. Two weeks later, the SEC has intervened to halt Arisebank's ongoing ICO, calling it an "outright scam" and alleging securities fraud in which the company claimed to have raised $600 million with a $1 billion target by making false claims and inadequate disclosures (in reality the company may have only raised $1-2 million). Assets have been frozen. The signs were all there from the beginning, from celebrity endorsement to audacious and unverifiable claims. Yet, it took some collective effort from the community to surface it, so kudos to those who took the risk and abuse. Because of you the ecosystem is getting stronger. This is significant as, if it passed, it would be the 1st token-specific law in the world passed by any elected legislative body. Federal law prevails over States law in the US justice system, however specific legislation on utility tokens does not currently exist at the federal level (only interpretation of federal law by unelected bodies like the SEC exists). So if this bill passed, and until a token-specific federal law is made, it could be given prevalence in court over any interpretation of general law. Wyoming, the Delaware of crypto? A second class-action lawsuit was filed against BitConnect, triggering a temporary restraining order granted by a US District court of Kentucky requiring a freeze of the company's assets. May there be any assets left. Polychain apparently has been having advanced talks with bankers about a $325 million IPO (P for once, not C) on the Toronto Stock Exchange, eventually leading to Olaf putting such plan on hold. Hard to believe that Polychain struggled to raise more capital in the private markets, to the point of even considering a listing of last resort. One would have expected and ICO at the very least, to dogfood it. Perhaps an attempt to push for further legitimization of the asset class on Wall st? Polychain subsequently denied the rumours of having had discussions with bankers about an IPO, calling #fakenews on Bloomberg. In a rather convoluted reverse-takeover deal, Ethereum Capital aims to raise $50 million to purchase controlling shares of ethereum-based startups and tokens and then get listed on the Toronto Stock Exchange. The Board will include the likes of Joey Krug and Boris Wertz, as well as representatives from OMERS the Canadian pension fund that is sponsoring the private placement. The most interesting thing here is the investor, rather than the investee (not taking anything away from Riot, a decentralized Slack built on the Matrix protocol). We've seen crypto projects creating ecosystem funds, now we are seeing them making direct investments in other projects.